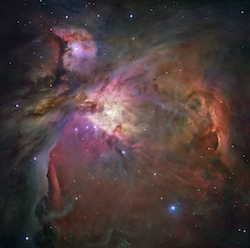 Just over one year ago, a small spacecraft called MOST began a month-long observing run on one of the most spectacular objects in Earth's skies, the beautiful Trapezium region at the heart of the Orion Nebula, M42. My collaborators and I applied for and received this observing time to survey variability in this young stellar cluster -- partly to study the eclipsing binary BM Ori (theta 01 Orionis B), but also to survey as many young stars that we were able to using the unique capabilities of MOST. Since then, I along with my collaborators -- our Director Arne Henden, Bill Herbst of Wesleyan University, and Joyce Guzik of Los Alamos National Laboratory -- have been working to reduce and analyze these data to study variability in the Trapezium, and the bulk of our work is now reaching its conclusion. The resulting data provide a fascinating look at young stellar variability, and a tantalizing hint of what long-term, intensive observations might reveal. In the April 2012 Variable Star of the Season, I'll be talking about our project to observe the Trapezium region and the variability of Young Stellar Objects that makes them so interesting to astronomers, amateur and professional alike. Much of this article was written in January of this year, while I was on an airplane headed to the American Astronomical Society Meeting in Austin, Texas to present our work. It provided me with some much-needed free time and perspective to write an overview of what we did, what we found, and most importantly, why we were looking. Stars form in groups out of large clouds of gas and dust that fragment and collapse into individual stars. The details of how exactly this process stars and proceeds is still being disentangled, but we know that when star clusters first form, the objects that form have a well-defined distribution of stellar masses called an initial mass function. A young cluster will be made of a few very massive stars, and increasing numbers of lower-mass stars, eventually forming a great many low-mass stars. Young clusters will appear very bright because of the massive, luminous, and short-lived stars, but as the cluster gets progressively older, these massive stars die, leaving the rest of the cluster stars behind. The younger a cluster is, the more bright massive stars you'll find. Stars more than 10 solar masses or so only live for a few million years, so if you see such massive stars, you're seeing a cluster newly-born, cosmically speaking. Image credit: Adam Block/Mount Lemmon SkyCenter/University of Arizona. Often, when such clusters are found, you'll also see nebulosity surrounding it. Some of the nebular light comes from dust scattering, the dust being the leftover ashes of stars from which the new cluster formed. The rest of the cluster light is emitted by the gas itself, which fluoresces in the ultraviolet light emitted by young, hot stars. 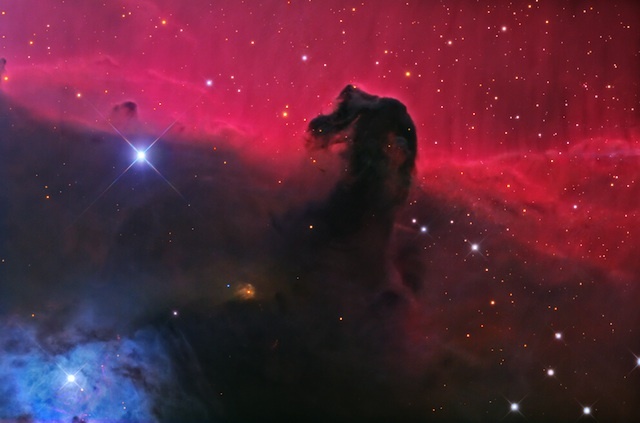 Such nebulae are called "HII-regions", the "H-two" meaning the gas is primarily ionized hydrogen, HII or H+. Ultraviolet light from massive stars ionizes the nebular gas, and as electrons recombine with protons to reform atomic hydrogen, they emit light as the electron falls through the electron energy levels within the atom. In optical light, HII regions are most prominent in the light of the Balmer H-alpha line at 656.3 nm, which gives the nebula its lovely red color. The Orion Nebula, M 42 in Orion's Sword, is such a cluster. Current best estimates put the age of M42 at no more than two million years, and there are several bright O- and B-type stars within the cluster that provide most of the energy that illuminates the nebula. These stars are always most prominent in any images of M42, but looking closely, there are thousands more fainter stars close by, and those stars will make up what astronomers of the future will see as an open cluster, long after the brightest stars end their lives as supernovae, and the gas and dust have dissipated. Our own Sun was born in such a cluster over 4.5 billion years ago, and although our own cluster has since been dispersed throughout the galaxy, the environment surrounding the Sun was likely far more spectacular than any photograph of M42 could be. In fact, this is one of the reasons why we are interested in young open clusters like M42. In addition to being intrinsically interesting objects themselves, they can serve as a model for how our own Sun might've formed billions of years ago. The young, solar-like stars within the Trapezium region could well be showing the same kinds of variability now that our Sun might've shown at its formation. By studying young stars -- especially the young variable stars -- we can learn more about where we ourselves came from. The Trapezium is a tight grouping of half a dozen O- and B-type stars at the very center of the nebula, all of which are bright, blue, and bound to be short-lived. This group of stars is also known as "theta Orionis", and each of the stars within is assigned a number and a letter. The stars of the Trapezium itself are "theta 01 Ori", and individuals within the group are given letter designations A, B, C, and so on. A few of these stars are known to be variable: theta 01 Ori A is known as V1016 Ori, while theta 01 Ori B is BM Orionis, an eclipsing binary with a period of 6.5 days. BM Ori has long been known as an eclipser, but intensive observations have been few and far between over the years, and it isn't yet fully understood. It's of interest to us not only because it's a young system with massive components, but most intriguingly the binary itself may be changing over time, and intensive time series of the light curve and eclipses can potentially tell us how the system is evolving. It's not a given that a star in the field is necessarily a cluster member, but past work that examined the proper motions of stars in the field suggested that a number of prominent named variables (like T Ori) are indeed members of the same parent population as the Trapezium. Any variable can tell you something about itself through its variability, but a bona fide cluster member will also tell you something about the cluster too. That's why variables in clusters are important topics of study. Although we've recently begun requesting more intensive observations of several YSOs, young stars have been targets of the AAVSO for a long time. One of the most famous of these is T Tauri itself -- namesake of the T Tauri stars, and for which we now have observations dating back to the mid 19th Century. This famous star lies well outside the Orion nebula, but it is a part of the larger Taurus-Aurigae star forming region. Another famous star that does lie near the Trapezium is T Orionis, a star that undergoes much more rapid variations than do typical T Tauri stars. Its variations are hard to understand unless you spend a lot of time looking at them carefully, which some observers have done in the past. As an example, the light curve below shows half-day averages of T Ori observations by David Levy during the 1979-1980 observing season. It's clear that the star shows wild day-to-day variations. Understanding such variations is doubly challenging -- do you have enough data to catch all of the variations, and if you do, what causes them? As with several other classes of rapidly-varying stars, the trick is to obtain as continuous a record of data as you possibly can, with both rapid cadence and long-time spans of coverage. That's impossible for a single-site observer to do, and very challenging for even a well-organized network of observers. But, what if you had an opportunity to observe such targets with a single telescope 24 hours a day for days at a time? MOST stands for Micro-Oscillations of STars. 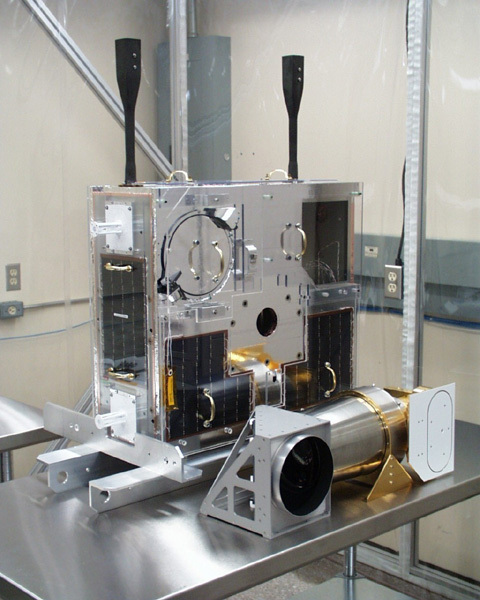 It's a satellite about the size of a large suitcase launched into low Earth orbit in 2003 by a Canadian-led consortium of astronomers interested in stellar pulsation and other kinds of stellar variability. MOST orbits the Earth about once every 91 minutes, and if the objects are in the right part of the sky given the Sun and Moon constraints, MOST can observe continuously, all day, every day, for months at a time. By doing so, researchers can obtain a continuous span of data without having to deal with the daily data gaps that single-site, ground-based observations face. This can greatly aid in the detection of weak, periodic signals as might be caused by pulsations in a distant star. MOST was designed from the start to do continuous photometry -- and only continuous photometry. There are no filter wheels and there is only a single camera with a 15-cm telescope. It is, for the most part, a flying telescope, with only the bare minimum of onboard instrumentation required for power, flight control, and communication. Over the years, MOST has observed a number of other stars, among them pulsators across the HR diagram, along with all number of other kinds of variable stars. Although MOST is primarily a Canadian project, the United States provided some annual support and funding for the spacecraft operations in exchange for a limited amount of time on the spacecraft. Observing time was then awarded competitively through NASA's grant-making program. In late 2009, we applied for time to observe BM Ori, the Trapezium, and around 50 more variables within the half-degree field of view around BM Ori. Although the project was focused squarely on BM Ori, we were hoping to learn more about variable stars in the Orion star forming region, including both young stellar objects and other kinds of variables -- especially young pulsators like delta Scuti stars. Individual variable stars can tell you something about the physics behind that individual star, but a large sample of co-evolving variable stars with similar chemical compositions and ages would be a really great way to expand our knowledge of this particular cluster. We were notified that we'd been granted time in April 2010, and the observations were made in late December of 2010 into mid-January of 2011. We received our light curves in May 2011, and have since been working to reduce the data and understand the variability that we see. We have data for 37 stars, measured once every 30 seconds, for over 27 days. Aside from short gaps in coverage once per orbit, the light curves are nearly unbroken for an entire month. I show a few light curves from MOST in the next section. The data from MOST are very exciting, but reduction of the data has been challenging, mainly because of residual signals from scattered light from the Earth and Moon. The spacecraft design is such that it is sensitive to external light, and there are also light leaks that lead to transient signals. Further, since there are so many observations per star -- over 35,000 observations per light curve -- we've been working with the automated pipeline photometry rather than the image frames themselves, and then working backwards to try and remove these "image defects" from the photometry. Much of our upcoming paper on these observations will be devoted to how we dealt with many of these signals, while future papers will deal with particularly important individual stars. It's been a challenging project, but in the end all that work paid off, and we've succeeded in producing a wonderful new data set for these stars, showing some of the remarkable variations that young stars undergo. We don't think we found conclusive evidence of pulsation (yet), but we have found more than a dozen stars showing all kinds of variability, and we hope to use this information to tell us more about star formation in M42, and the young lives of the stars that it is making. Along with the MOST data, we also have ground-based data that we're working on, since AAVSO observers provided observations for the campaign announced in Alert Notice 427. We're in the process of interpreting those data, along with both the MOST photometry and photometry from AAVSOnet's Bright Star Monitor. We present some of these results below. MOST provided us with four light curves of stars in the central Trapezium, theta 01 Ori A, B, C, and D. Of the four, only that of theta 01 Ori B, BM Orionis, shows clear evidence of intrinsic variability. Eclipses of the primary are clearly visible, and a secondary eclipse is also apparent. Like many eclipsing binaries, there's also a clear reflection component present, where light from the primary reflects off of the secondary, meaning that the light curve varies out of eclipse as well as in eclipse itself. Bill Herbst at Wesleyan has been observing BM Ori and other young stellar objects for many years, and he and his students are leading the analysis of this star. What he's found so far is intriguing. The duration of totality of the primarily eclipse has changed since the last time-series observations were made nearly two decades ago. This strongly suggests that the orbit of the stars about one another is changing. While we're doing a large survey paper discussing all of the observations, we're also working on a separate paper just on the BM Ori results. There have been many speculations as to what BM Orionis really is -- similar to the speculation surrounding epsilon Aurigae -- and we're hopeful that our analysis of the light curve will clarify what is happening in this very, very young binary star. I'll talk more about our results on this star in a future article once our work is done. One of the most fascinating serendipitous discoveries in our data set was the detection of multiperiodicity in the star MWC 114. Although it was already known to be a Be-star, it was only a suspected variable until now. The MOST light curve for this star is truly remarkable, showing clear evidence of rapid multiperiodic variations. These variations are at the level of about 0.01 magnitude in brightness, with a cluster of periods around four hours. The light curve is beautiful to look at; it shows the unmistakable signature of multiple modes, a beat pattern where the amplitude of the primary variation is modulated over the span of several days. We haven't yet determined what is causing the variations. They're very reminiscent of pulsations, and B stars are known to pulsate. However, Be-stars are known to be rapidly rotating, very close to the breakup velocity. This rapid rotation is the source of the disks and mass loss that characterize these stars. Rotational frequencies of 3-6 cycles per day would yield a rotation rate near the Keplerian breakup velocity for something the size of a Be-star. Do the frequencies come about from the star itself, or the disk, or an interaction between the two? We don't yet know, but we hope to understand this beautiful light curve better very soon. Earlier I highlighted past observations of the star T Ori, and showed a single season of visual data. The visual data proved that T Ori is indeed highly variable, but the MOST light curve really drives the point home. It never stays constant, but changes constantly, continuously, and (apparently) smoothly, at least over the 27 days that we observed with MOST. These variations are similar in both magnitude and timing to what AAVSO observers have seen over the past hundred years that we've been monitoring this star, and it is clear that T Ori and other stars like it never stop varying, at least on the timescales that we observe them. There are some tantalizing hints of coherence -- perhaps something quasiperiodic -- but during this "short" stretch of only 27 days, its clear that T Ori has a lot going on, and a sensitive search for short period variability showed nothing periodic or quasiperiodic. It's tantalizing to think what a longer stretch of data might tell us about T Ori and other similar stars, but that will be a job for a network of ground-based observers -- like you! One disappointment we've had thus far with the data is that there's little evidence for pulsational variability among the sample. Other than MWC 114 (which is very exciting), only one star showed faint evidence for pulsations with a single period, and even that one star only shows a single weak period. Given the power that multiperiodic pulsation can have for telling us about the interior structure and composition of stars, we were hoping to find more. We'll be digging more deeply into our reduced data to search for very low-amplitude pulsations in some of our constant stars, and even without pulsators, we have a fascinating sample of young stellar variables. There are several other stars that show irregular variations like T Ori, including MX Ori, NV Ori, V361 Ori, V372 Ori, V566 Ori, V2149 Ori, and NSV 2184. The data show that their variations are irregular, rapid and large, all common occurrences among YSO variables. Such stars mainly vary due to rapid changes in either the disk around the star or the circumstellar environment. The stars can brighten rapidly if the the accretion rate around the star increases for some reason, or if the star briefly peeks through any dust clouds that orbit around it; they can fade for precisely the opposite reason -- often due to obscuration by dust, or by temporary decreases in the accretion rate. Along with the irregular variables there are a handful of stars showing periodic or quasiperiodic variations. The eclipsing binary BM Ori and the Be-star MWC 114 are certainly the most obvious, but there are a number of lower-amplitude variables mixed in. Most are likely to be rotating stars of some kind, with periods on the order of a few days. These include V1232 Ori, AN Ori, and two other stars not previously known to be variable. All four of these show quasiperiodic variations of between 5 and 20 percent. Their variations seem stable in period, but it's clear their light curve shapes change from cycle to cycle, suggestive of rotating stars with changing starspot patterns. Another periodic star is LP Ori, a star of early spectral type (B1.5) with a period around four hours but much lower amplitude than is seen in MWC 114. It's hard to tell by looking at the data that it is varying, but both Fourier analysis and autocorrelation show a single, low-amplitude signal (much less than 1% in amplitude, but very coherent). This will be another star that we're looking at more closely to try and understand how and why it's varying. In Alert Notice 427, we requested observations of a number of targets in and around the Orion Nebula, including some interesting variables outside of Orion, like RY Tau and RW Aurigae. We received observations of 13 of the MOST sample, along with an uptick in the number of observations of stars in the wider field like T Tau. A few instrumental observers have added these stars to their observing queues as well, and we're starting to see some V-band light curves along with the visual data. Our first priority was to use the AAVSO community data to fix the magnitudes colors and provide a basic flux-to-magnitude calibration for the MOST data, which we've now done. We'll soon be looking more deeply at the AAVSO data for these stars to see what other science is possible using the community data. We also have some Bright Star Monitor photometry that remains to be reduced -- they were already processed, but subsequent analysis showed that there was a stray low-amplitude variable among the comparison star ensemble. Arne Henden and I will be working together identify it and reanalyze the images; once we do, all of the BSM photometry will enter the AID for community use. Getting a stray variable comparison star wasn't an especially surprising development. Mike Simonsen had to be very careful in setting up new sequences for stars in the Trapezium region when he did so back in early 2010, since it's very hard to find non-variable stars of appropriate color in the field. Our sequences for this region are now better than they've ever been, but even so we have to be careful with these data. All of this will need to be taken into account when the AAVSO data are analyzed in the future. The past few years have brought several new campaigns and programs to AAVSO observers, and our project with MOST is just one of them. In 2010, Dr. Colin Aspin requested observations of two YSOs that entered active states that year, the stars V2492 Cyg (= VSX J205126.1+440523) and V2493 Cyg (= HBC 722), and observations of those stars are requested through the end of 2012 at least. More recently, Dr. Hans Moritz Guenther of Harvard-Smithsonian Center for Astrophysics requested observations of SU Aur and AB Aur in support of his successful XMM-Newton observing run in mid-February 2012. We're hoping that these successful campaigns will lead to new collaborations with the YSO research community, providing a new avenue for AAVSO observers to participate in cutting-edge research. The AAVSO archives also continue to be a rich source of research projects, with Dr. John Percy publishing new analyses of many long-term light curves of T Tauri stars with his students. There are some new Pro-Am observing programs coming up in the next few seasons, and we look forward to announcing them to the AAVSO community when their programs are finalized. More importantly than these specific campaigns however is the new community initiative on these fascinating variable stars. Observer Michael Poxon recently launched the Young Stellar Object Section for the observer community, geared to support observers interested in pursuing YSOs. The section is off to a very active start and has even drawn support from the professional research community -- Drs. Colin Aspin and William Herbst (the latter a Co-I on our MOST project) have been providing suggestions and scientific justifications for new observing projects, as well as giving important background on the astrophysics of these important stars. We're thrilled to see this new section in operation, and we encourage observers looking for new and exciting ways to participate in science to consider YSOs in your observing planning. Be sure to stop by the YSO forum, too! As for the MOST project itself, one of the clear results that is already apparent is how challenging the YSOs are to observe, since many show little or no predictability. However, they also provide interesting new avenues for amateurs interested in carving out a unique niche for themselves. As an example, there is little calibrated, multicolor long-term photometry for many of these sources. While single-filter or visual observations are useful for learning how stars vary, multicolor photometry can begin to tell you why they vary. We know some of the mechanisms involved, but there's little knowledge of individual stars, and a surprising number of objects have little or no detailed observational history that would give a clue as to what they might be. And given that we found two new variables from a month's continuous monitoring, careful photometry of stars in this region may reveal more new variables. But don't forget one of the more basic reasons to observe these stars, too. YSOs are often associated with prominent nebulae and star formation regions, and are often beautiful as well as productive targets for observations. The Orion Nebula is one of the lovelier sights of our nighttime skies, and one that's available to nearly all observers around the world. It's a wonderful reminder that something as bright and beautiful as Orion still holds mysteries to explore, and can still teach us new things about the universe that we live in. The next time you're showing Orion off to a budding new astronomer, you can point out that astronomy has both an intellectual and aesthetic appeal. And be sure to make a few estimates while you're at it! This Variable Star of the Season article was written by Dr. Matthew Templeton. The AAVSO acknowledges support for this project from the National Aeronautics and Space Administration through NASA grant NNX10AI83G.